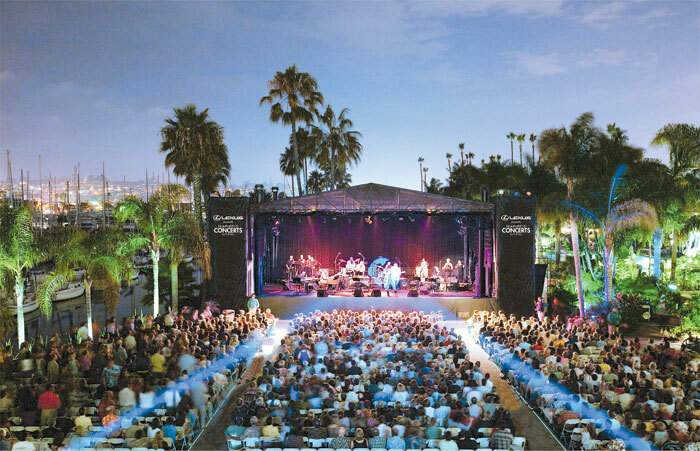 SAN DIEGO — Boaters can enjoy live music and comedy performed by world-famous entertainers in an annual summer tradition, at Humphreys Concerts by the Bay. Launched in June, the annual summer concert series brings an eclectic lineup to the bay, with artists including Willie Nelson, Chris Isaak, Steely Dan, Chicago, The Monkees, Yes, the Gipsy Kings, Bill Maher, Sugar Ray, Fastball, Huey Lewis & the News and Garrison Keillor. “Our 32nd anniversary of Humphreys Concerts By The Bay features 53 evenings of entertainment, with more shows being added throughout the season,” said Mitzi Stone, promotions director of Humphreys Concerts. “As always, Humphreys will present a typically broad array of rock ‘n roll, blues, R&B and comedy. This 1,400-seat outdoor waterfront venue provides an intimate concert setting with a boat party atmosphere included. Located on the site of Humphreys Half Moon Inn and Marina along Shelter Island Drive, the venue has hosted performances by numerous music legends over the years. While the venue’s intimate outdoor setting makes it a hot ticket, the waterside access for boaters in Half Moon Marina makes it distinctly boat-friendly. Those lucky enough to get slips with views of the concert stage regularly hold parties aboard their vessels — and boaters aboard kayaks, canoes and electric runabouts regularly fill the channel, hoping to get a glimpse of the show. Guest slips are available on a first-come, first-served basis and the nightly rate doubles on concert evenings. For details, call Half Moon Marina at (619) 224-3401. Concert tickets are available separately or in a variety of special event packages that include dinner at Humphreys Restaurant and/or accommodations at Humphreys Half Moon Inn. Both the restaurant and hotel are located adjacent to the concert venue at 2241 Shelter Island Drive. For ticket information, visit humphreysconcerts.com. July 10: Railroad Earth/Bruce Hornsby & the Noisemakers.